Once their children were on their own, the owners of this delightful craftsman-style jewel box relocated from a much larger house on the Lake. The late local architect John Gabriel designed the grand house on Shell Beach Drive which was featured on the 39th Annual Palm Sunday Tour—Windows on the Water—in 2013. Since that time, the Boyers have converted and shaped this property into a chic and stylish residence scaled perfectly for modern living. The house itself began life more modestly. It was constructed in 1954 by Bill and Monnie Boyer, the current owner’s parents, in a thoroughly mid-century mode, with a good general layout, but with an uninspiring exterior and materials. It had long served the extended family as a residence, a pool house and a guest house, and functioned for a time as a sort of urban camp for members of the Jones and Boyer families. When the current owners moved back in temporarily after the move from Shell Beach Drive, they soon realized that the location and the potential of this site were perfect. They quickly decided to purchase it from family to convert it to their own. Professional architect Mark Solari was selected to help make the change from a mid-century ranch with orange brick, redwood vertical siding, large overhanging eaves and undersized windows. Rafters once hidden in blocky eaves were revealed to be fir and were hand-shaped to form decorative rafter ends characteristic of the craftsman style. There is a sheltering nature to the home, a secure nest for the family that lives in it. As you tour the home, take note of the beauty and utility of the family pieces that grace the rooms. There are personal touches everywhere that make the house feel like a home. The current owners, a young family with children, benefit from the convenient and central location of the property, close to the busy downtown, close to work, close to school and a quick ride to the amenities anywhere in town. This house is in a City-recognized Historic District and subject to design guidelines and review. 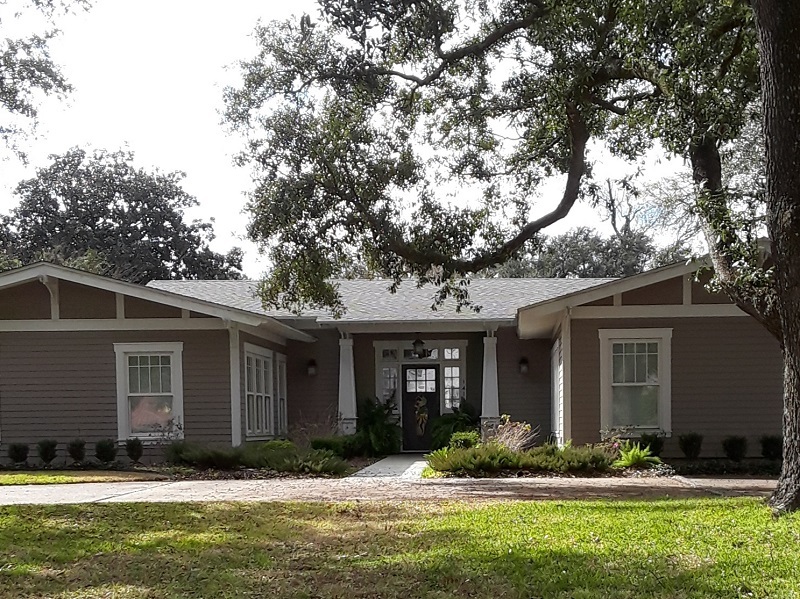 While this authentic raised Louisiana cottage maintains a reserved and respectful exterior, the interior is a wonderful example of progressive and stylish design for the modern young professional. The owner, an active entrepreneur with a successful niche bakery and catering business, comes from a creative contracting and real estate family with dozens of successful construction, housing and design projects to their credit. In renovating and updating this particular house project for a family member, the utmost care was used to ensure that the results would be both practical and stylish. The raised cottage with a front porch is an historical Southern approach to living space and practical housing. Basically symmetrical, with one room (or bay) on either side of a prominent front door, these cottages benefit first from having the welcoming and protective porch. In some versions in South Louisiana, the porch—or gallery as it is sometimes called—is used as an additional exterior room with swings, rockers, and porch furniture. And, of course, particularly in this City that once commercially processed pine and cypress lumber, the raised cottage is built of wood. You are welcome to stop here, enjoy a complimentary beverage and tea cookie, and enjoy the flowers and the site as part of the 44th Annual Palm Sunday Tour of Homes. The unusual and stately home is the backdrop for the lovely garden and refreshment point on the Palm Sunday Tour. The home is that of Sarah and Bob Jones, a couple with a truly remarkable record of public service and of creativity in the arts. A private and independent home with its own grounds, the property is still part of the “Ming Grove” concept of Louise and Sam H. Jones, a concept of familiar surroundings, comfort, and utility. In an entirely different style from the other family-connected properties, the garden provides a restful stop to Tour guests. The courtyard style features seasonal color and privacy, while allowing for great access and views. 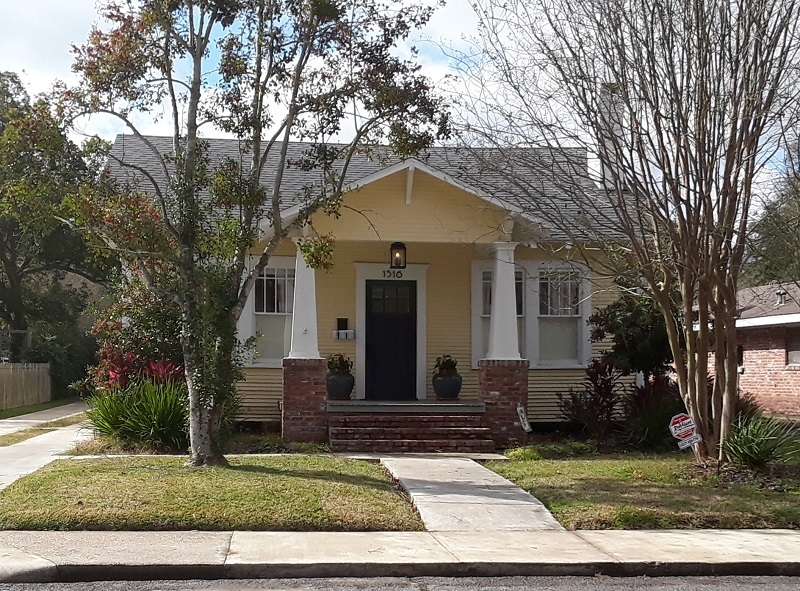 The Jones house follows a traditional South Louisiana plan, long in use for homes built in the coastal plain. The principal living spaces are on the second floor, which in the past permitted cross breezes to keep the house comfortable. Today, of course, the second floor living spaces allow for broad views of the scenic waterfront. According to the redoubtable Louise Boyer Jones, wife of reform Governor Sam H. Jones, “Ming Grove represents to me an area rather than a house. It means a way of life I wish for my mother, my children, my husband and me. To a great extent this philosophy and life wish is still in place in this beautiful corner of waterfront Lake Charles. The stunning home, now resided in by the Laborde family, started out as the concept of Sam and Louise Jones, who spent years dreaming, planning and researching the first and only house Mrs. Jones would ever build. Having been the First Lady of the State during the trying years of World War II, and the longtime spouse of a political figure and statesman, Mrs. Jones had had her share of temporary housing and makedo accommodations. With a pragmatic, forward-thinking and very modern approach to house design, she crafted a house like no other in the city, and one of the most innovative and unusual structures in the South in its day. 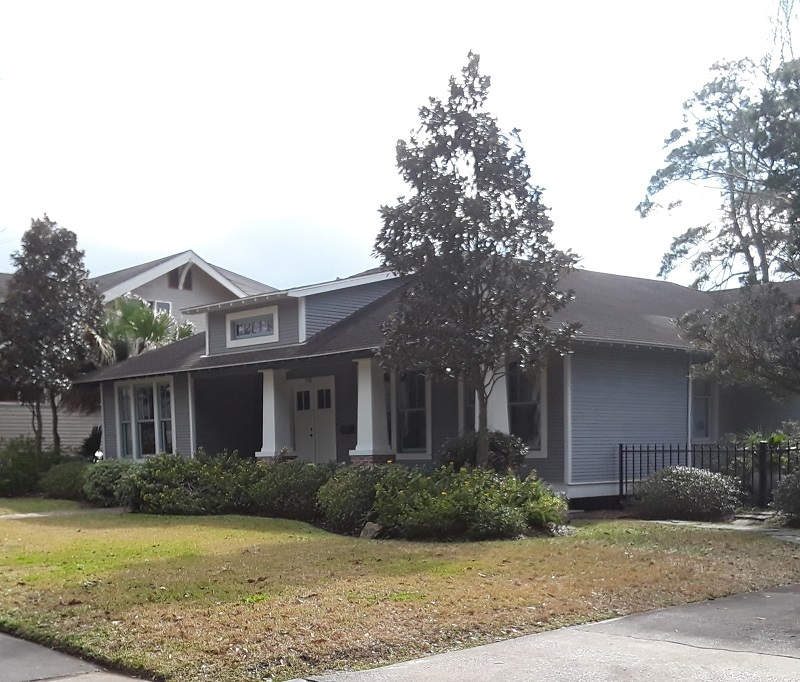 This charming two-story guest house started life as part of the rebuilding and improvement of Lake Charles after the Great Fire of 1910. The Fire, which destroyed much of the downtown wooden core of the City, resulted in the decision to rebuild better and stronger. Part of the plan was a series of new fire stations scattered throughout town. These stations were to be equipped and staffed for immediate remedy should fire break out anywhere. Post Fire, the streetcar lines were extended north, east and south to serve the new subdivisions like Margaret Place. The area had been farmland and pasture, but by 1912 growth was sufficient to require a new firehouse for what was then Ward Four. A contract for $1,798 was won by local builders Barney and Woodson for a two-story station designed by architect I.C. Carter. The station was to be located at the corner of South Ryan and East Streets, on a rare triangular lot with access to both streets. The station was to serve the immediate area, including Margaret Place and areas as far west as St. Patrick Sanitarium and Barbe Pier. By 1927, with the advance of motorized fire fighting equipment, the Fourth Ward Fire Station had outlived its usefulness. At the end, the horse-drawn steam engine located here and the firemen were reassigned, and the building was rented out commercially as a service station. First operated by Artemus Fullington, and later by Gilbert Fontenot, the building was known as the South Ryan Service Station. Later it was known as Klock’s Auto Repair. 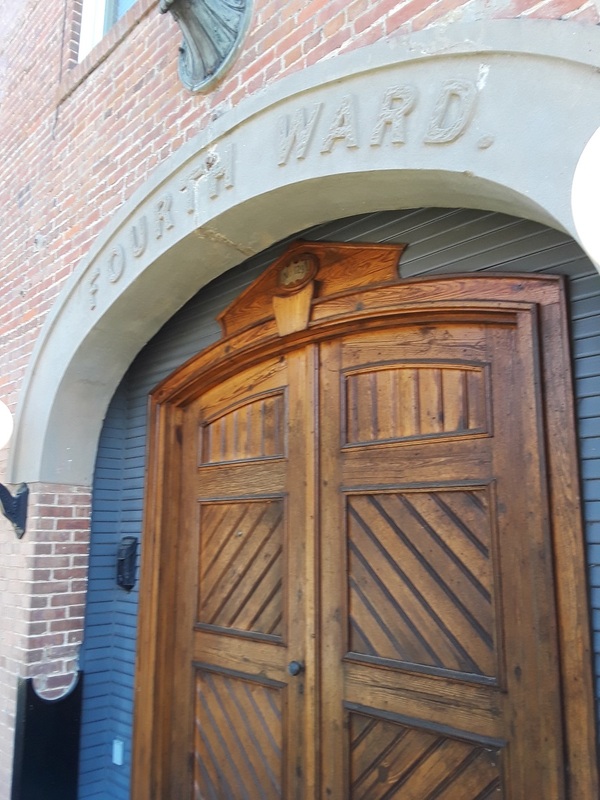 During this time, the second floor was used for a variety of purposes, including apartment rental, a used furniture store, and for a time, a commercial cannery. In the Second World War, the site was sold by the City to private owners, who maintained it as mixed rental property until the mid 1960s, when the building faced a long period of virtual abandonment. In the 1980s, there was renewed interest in the area and the building.